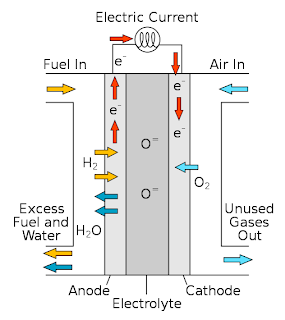 A microbial fuel cell (MFC) or biological fuel cell is a bio-electrochemical system that drives a current by mimicking bacterial interactions found in nature.A microbial fuel cell is a device that converts chemical energy to electrical energy by the catalytic reaction of microorganisms. According to BBC Science and Environment ,US researchers say they have demonstrated how cells fueled by bacteria can be “self-powered” and produce a limitless supply of hydrogen.Microbial fuel cells hold promise as a new source of electricity by their unique ability to generate an electric current from waste products. Modeling the processes in microbial fuel cells could pave the way for improving the voltage output and take us one step nearer to using these devices to produce electricity. How Microbial Fuel Cell works? We all need food to survive, in the same way, bacteria needs energy to survive. 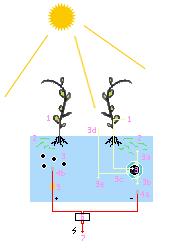 The first step requires the removal of electrons from some source of organic matter (oxidation). The second step consists of giving those electrons to something that will accept them (reduction), such as oxygen or nitrate. If certain bacteria are grown under anaerobic conditions (without the presence of oxygen), they can transfer electrons to a carbon electrode (anode). The electrons then move across a wire under a load (resistor) to the cathode where they combine with protons and oxygen to form water. When these electrons flow from the anode to the cathode, they generate the current and voltage to make electricity. They are attracting lot of attention because of their huge potential of generating electricity.